Important lettering & design elements you would like incorporated with your memorial? Remember to take time and reflect so you don’t forget something important and special. your memorial forever. Examples of personalization are shown below to assist in your selection. Memorial Finish, Color, Size amd Shape can be mixed and matched according to your wishes. All designs can be mixed, matched, sized and positioned according to your needs. 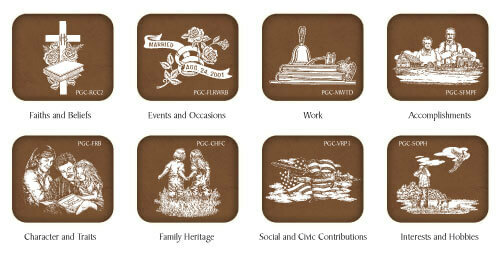 We have thousands of Precision Graphic Carving designs for you to choose from. These designs should be used on medium to dark colors. Granite is a unique natural product. Actual granite colors will vary from the photos shown.